This year has been so busy. We're in Week 2 of the term and the holidays feel like they were about 6 months ago. We have our parish fete on this Saturday, as well as birthday party for one of our foster son's siblings who live with another carer. There's the normal rugby game and it's our team's day to cater and run the club BBQ. My daughter is preparing for her jazz and tap and exams and is performing at the fete. Rehearsals have started for "Sound of Music" and we are in the final weeks of rehearsals for the Rock Eisteddfod (dress rehearsal tomorrow night). My daughter has made a dress and entered it into a show. On Sunday she has to model it as part of the competition. And, of course, No 1 Son has his on-going social life. Mostly with Venturer Scouts - but it does keep him busy. He's heading off on the weekend for the next part of his abseiling course. That's a 2 hour drive from here and a pick up on Sunday. In the midst of all of this, we've had parent/teacher interviews at the High School and meetings at school regarding some of the children. So, there has been little time for sewing. I've managed a few blocks of my new Tis the Season quilt. I'm doing this one using a variegated green thread and will probably use greens for sashing. Haven't thought that far ahead. It's just nice to have something to take with me and stitch away. I've also had a couple of chances to play with my embroidery machine, so have some Sue Box designs sewn for a Christmas Quilt. She has some beautiful designs and I think they're a lot of fun to do for a change of pace. 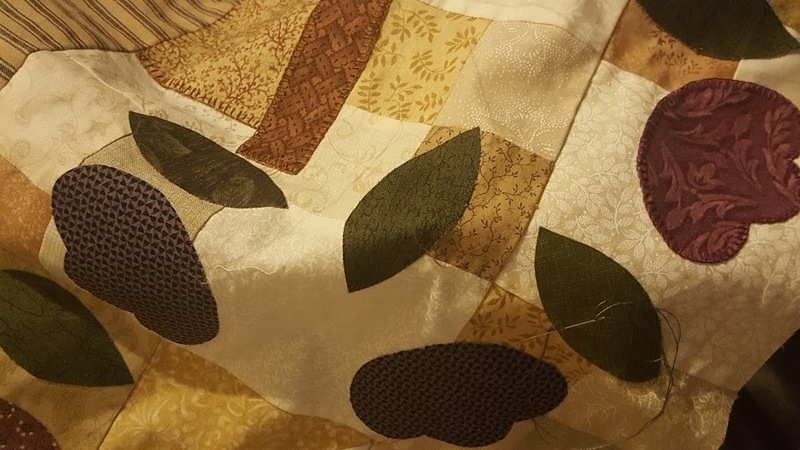 I'm going to do some sewing tomorrow with our local sewing teacher, not even sure what I'm going to try to do - possible an applique quilt I've been working on. I've signed up for Friday Night Sew in for this week. Hoping to be able to ignore everything and sew away. Will know how successful that has been on Saturday. Hoping August won't be quite as busy as July, but we have lots of costume sewing coming up for "Sound of Music" so it may be just as busy. Happy Sewing everyone!! Will endeavour to get some photos of my latest 'Tis the Season stitcheries. All I can say is good for you on having some handwork to take along - you are so busy! I love Sue Box designs, they're so detailed and gorgeous! Enjoy some 'you' time for FNSI.